This house has just undergone a major renovation. T Gallagher of Jericho Vt would love to host you!! Master bath has just been added and a new jacuzzi tub for two installed. Great house with an amazing view! The house worked very well for our family reunion! The kitchen is very open and functional with everything you could need. The dining room table fit everyone comfortably and the living space was open and airy. 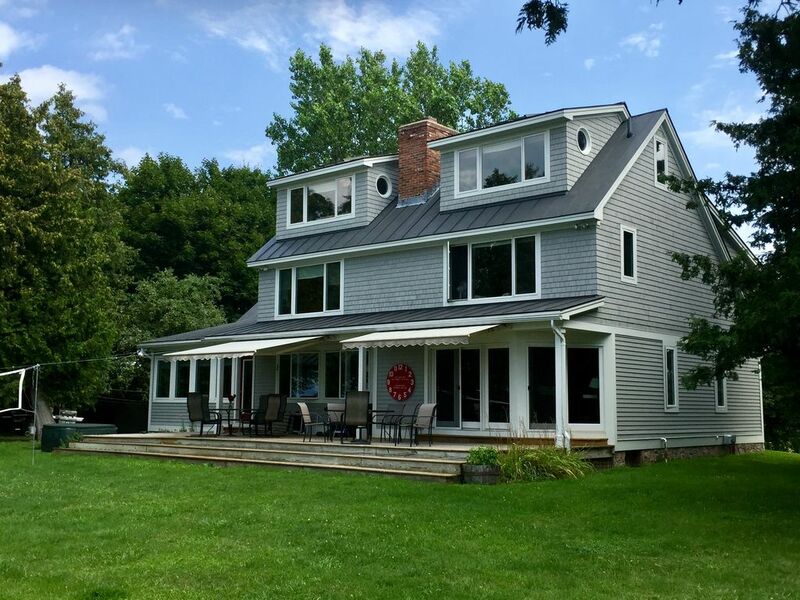 The best part about the house is the backyard with two hang out spaces perfect for spending time looking at Lake Champlain and the surrounding mountains. The lake was very swimmable and the two kayaks and paddle boards were always in use. A big bonus for us as we didn't have to rent anything! The stairs down to the lake are very steep but everyone handled them well. We honestly felt content just hanging out at the house most of the time because the view was so amazing and the water sports were so much fun! John was very easy to communicate with and was very attentive. I highly recommend staying in this beautiful home! It was absolutely beautiful and the perfect spot for my family to come together. The property was clean and there were all of the necessary items to make it enjoyable. Great location and convenient to local area activities. Well appointed kitchen and great views. We stayed at this location over Christmas and to New Year’s Day with our family - 14 people in all - during a brutally cold week in VT. We were safe and warm inside with the wood burning stove adding ambience and additional warmth. The gas stove on the new sitting room was also a wonderful place to engage in a puzzle or conversation. Views to take your breath away - especially as we watched the lake freeze over. A very well appointed kitchen with high end cookware and the gadgets you need. Large master bedroom and bath with jacuzzi tub. Four season sun room set off from kitchen and a good get away spot. Sleeping space for all of us. The owner is very accommodating and accessible. They checked on us as a courtesy, to which we were grateful. He also resolved the small questions we had easily by phone, since he knows his property well. This is a property we would consider returning to during any time of the year, but would like to experience it in the warmer months. Though it can accommodate the full load of people, I would think the best number for a group would be 5 couples (10 people) since every pair would have their own space. And it would be even better for eight people or fewer. Wonderful house for family vacation! This ended to be the perfect house for our family. The kids loved the third floor dorm and there was plenty of space for the 11 of us. The kitchen was well equipped with everything you need. The view was amazing and there was plenty of space outside to play badminton, soccer, etc. not to forget the kayaks to enjoy the lake. Of course South Hero region is amazing for biking, and we took advantage of it. Our one-day bike trip to Burlington was a nice adventure and allowed us to also enjoy the city. This was a wonderful family vacation. The owners, Tina and Jack gave us multiple tips and suggestions of things to do in the area and insured we had what we needed to spend a wonderful time. We would definitively go back again! We would definitively recommend to anyone who want to take vacation in the Lake Champlain region. Golf: Two golf courses on the islands one is 1.3 miles away. we no longer rent for New Years. we are very strict about our limit of 14. If at any time you plan on having more than 14 people you must discuss this with us first.